Largely eradicated as pests in the developed world (largely through the use of DDT) in the early 1940s, bedbugs have been resurgent since about 1995. With the widespread use of DDT in the 1940s and 1950s, bedbugs mostly disappeared from the developed world in the mid-20th century, though infestations remained common in many other parts of the world. Rebounding populations present a challenge because of developed resistance to various pesticides including DDT, and organophosphates. Bed bug populations in Arkansas have been found to be highly resistant to DDT, with an LD50 of more than 100,000 PPM DDT was seen to make bedbugs more active in studies done in Africa. Cimicosis is a skin condition caused by bedbug bites. Individual responses vary greatly. In about 50% of cases, there is no visible sign of bites, and for those who do have a visible sign, it varies in size and itchiness, greatly increasing the difficulty of identifying and eradicating infestations. Serious bedbug infestations and chronic attacks can cause anxiety, stress, and insomnia. 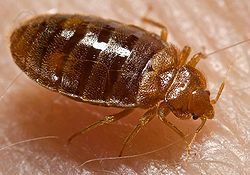 Development of refractory delusional parasitosis is possible, as victims develop an overwhelming obsession with bedbugs. Patients given systemic corticosteroids and antihistamines for the itching associated with bites will still have visible signs of bites. Topical corticosteroids, such as hydrocortisone, can reduce lesions and decrease itching. The application of hot water may relieve symptoms. The water temperature should be about 50 °C (122 °F), or this procedure may aggravate the symptoms. Disagreement exists as to why heat causes symptoms to abate. Heat might overwhelm the nerve endings that signal itch; it might neutralize the chemical causing inflammation, or it might trigger a large release of histamine, causing a temporary histamine deficit in the area.